The college experience is one of the most expensive and meaningful investments of time, effort, and money an individual will make in his or her lifetime. As of 2018 the average student loan debt of 70 percent of graduating seniors was $37,172. Entering the workforce with that much debt—or more—is just one of the reasons that choosing a college or university carefully is so important. However, for a huge number of students making their way to college, money isn't everything; in fact, it may not even be the main thing. The college years are, and should be, filled with new experiences and expansion of the student's worldview. Many students choose to take on socially responsible projects on their journey. Schools throughout the U.S. have vastly different approaches to fostering the ability of students to make these kinds of journeys; that is the purpose of this guide. This guide helps students make informed choices regarding the social consciousness of their potential educational options. Depending on interest, students can pursue acceptance at schools that offer classes or even entire programs about ethical practices, conservation, or similar issues. Many schools promote fantastic volunteer projects, and internship opportunities. And the various American colleges and universities score very differently when it comes to green initiatives, and sustainability. Florida's Center for Leadership and Service is the primary service programming organization at UF. CLS creates structure and support for anyone in the UF community that wants to get involved in community service. Programs include Florida Alternative Breaks for students who want to volunteer between quarters and the Gator Global Initiative, a social impact conference held on campus. The CLS also organizes an annual service awards ceremony to acknowledge the efforts and accomplishments of service-oriented UF students, staff and alumni. One of the most notable service engagement programs offered at UM is The Public Service Intern Program. This unique program prepares and supports students while they pursue and complete public service related internships in Washington D.C. PSIP has supported social service for more than 40 years, and around 80-100 Michigan participate each year. UC Berkeley students are famously justice and service-minded. The programs offered by the historic The UC Berkeley Public Service Center are too many and diverse to cover here, but suffice it to say that many of the nation's and the world's most important public servants have worked directly with the PSC since it was first established in 1967. Now, more than 4,000 students provide service to off-campus communities through the Center. The Carlson Leadership and Public Service Center works to integrate service learning into the academic experience of every Washington student. Staff and students at Carlson engage with the wider student and alumni populations by arranging campus-wide days of service, bringing public advocate speakers to campus, and maintaining partnerships with volunteer organizations throughout the world. The Carlson Center also works closely with the school's career and alumni offices, making it easier for Huskies to connect with service opportunities after graduation. The Morgridge Center for Public Service provides a semester-long Badger Volunteers program for Wisconsin students who want to gain experience in education, sustainability and public health in the Madison community or even abroad. The school also awards undergraduates stipends and credits for specific collaboration projects through their Wisconsin Idea Fellowships Program. Since its founding in the1960s, Morgridge has largely used student interns to reach out and engage Wisconsin alumni about participating in its activities. UT's Austin campus is home to a number of offices and programs dedicated to connecting students to service learning opportunities that will enhance their academic experiences. Current and former students from all majors and degree levels are supported through The Bernard and Audre Rapoport Center for Human Rights and Justice, the Bridging Disciplines Program, the Dean Jack Otis Social Problem and Social Policy Lecture Series, and the Free Minds Project, among others. The UCLA Volunteer Center offers a wide array of programs for its campus community and alumni network. Volunteers can choose from one day volunteer and fundraising events or can choose to participate in longer term projects and internships that take place in over fifty locations in the Metro LA area. UCLA also boasts one of the most active alumni volunteer networks in the nation. The Center maintains an Alumni Scholars program to leverage alumni networks and help UCLA students find volunteering opportunities and internships that best meet their academic, professional and service goals. UNC's Center for Public Service connects its Chapel Hill campus to its community and the rest of the world by providing service learning opportunities like alternative spring break trips, internship placements at local public health organizations and on-campus seminars in economic development and sustainability. internship placement, sustainability. The Center also helps to develop and implement service-based coursework in diversity and social involvement. The Service-Learning Initiative at OSU is dedicated to bridging the gap between a student's academic life and their social lives. Since 1914, the Initiative works to increase access and interest in public service by creating community-based coursework for the wider student population and hosting campus-wide volunteer days and workshops. The Public Engagement Office at UI takes service-based learning a step further than most school's volunteer centers. Students, alumni and staff make up two organizations dedicated to increasing levels of community involvement, the Civic Commitment Task Force and the UI Senate Committee on Public Engagement. Community partnerships are maintained and catalogued in a service database of over 350 opportunities for Illinois students to choose from. These two organizations also organize an annual Public Engagement Symposium on the Urbana-Champaign campus. 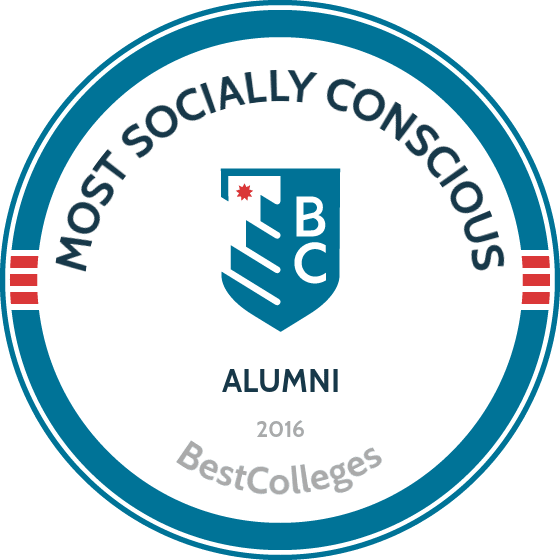 Using data collected by Teach for America and the Peace Corps, we've compiled a list of the 32 schools with the most socially conscious alumni in America. Teach for America assesses the "Top Colleges and Universities Contributing Graduating Seniors to Teach for America's 2013 Teaching Corps," while the Peace Corps assesses its list of the "Top Colleges 2013" for Peace Corps participation. To make our final list, each school had to appear on both of these rankings. Our final list of 32 schools is not ranked, and it is organized by school size. We've arranged them according to Carnegie Foundation for the Advancement of Teaching's basic size classifications for colleges and universities. "Large schools" have 10,000 or more undergraduates in attendance, "medium schools" have 3,000 to 9,999 undergraduates in attendance, and "small schools" have fewer than 3,000 undergraduates in attendance.